After my Classic Setup Series announcement two weeks ago, I’m pleased to introduce the first Classic Setup submission, from fellow writer and translator Nicola D’Agostino. Freelance writer, translator, teacher, musician, graphic and web designer, Nicola D’Agostino writes a lot about Apple (check his Stories of Apple website, among other things) and lives in a house full of comics, books, music, old computers and software. 1. What does your desk look like? A PowerBook G3 Series used as a scanning workstation. 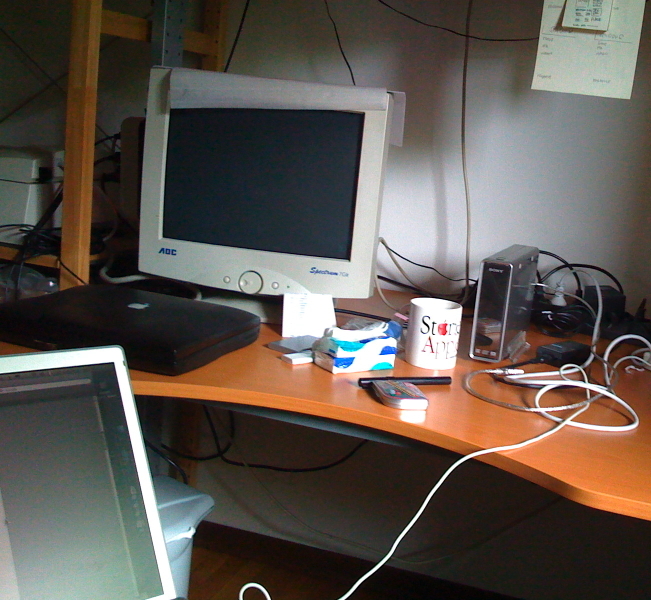 On the left you can see a glimpse of my SCSI scanner. (The original image, with additional notes in Italian, is here). 2. What is your vintage Mac setup? In our house we have a lot of old Macintoshes but two in particular get used almost daily — a couple of almost identical PowerBooks G3 Series from 1998. Both have a 14″ screen, a 266MHz G3 CPU, 320MB RAM, and — when needed — they share modules for CDs, DVDs, floppies, ZIP drives and so on. Their setups are quite different: one sits in my studio, connected to a SCSI scanner, has Mac OS 8.6 and a lot of installed software and is also equipped with a Netgear wifi card. The other one is in the living room and is (sometimes) connected via Ethernet to our router and via audio cable (3.5 mm to RCA jacks) to the Hi-Fi stereo system. It has a standard, if not stripped down install of Mac OS 9 and Mac OS X 10.4 (through XPostFacto) which are roughly equivalent in functionality. It also has an additional hard disk in a MCE module. 3. Why are you using this setup? The Mac OS 8.6 PowerBook G3 is basically a scanning workstation: it serves the purpose of acquiring images through a professional A4+ Agfa scanner which is connected via SCSI to the HDI-30 port. Sometimes it is also connected to an old serial A3 graphic tablet. The dual-boot PowerBook G3 is our CD player. After three broken CD players we gave up and set up a Mac to play CDs and mp3s and rip the occasional CD. 4. What software do you use, and for what do you use it? The “scanning” PowerBook G3 has Photoshop 5.5 for minor (or major) retouching, Graphic Converter and a copy of Transmit, for uploading images to an FTP address. It also has a lot of other software applications, being the former day-to-day Mac of my girlfriend, such as iCab, Mozilla, and lately also Classilla and so on for occasional light browsing. The “CD player” PowerBook G3 has iTunes in both Mac OS 9 and Mac OS X, of course different versions but absolutely fine for the intended use. There’s also other standard software but it is rarely used.